Time to go back. We decided to try a few water sports at the Yaguchi water sports complex on our way back. To be frank, we doesn’t want to try any, but as we spent some good amount on the package we thought that we shouldn’t miss any part of the package 😉 . We reached there in about 20 mins from Chikmaglur and the path leading to the water sports complex is beautiful. To be frank, we were not at all excited by the sight of the water sports complex. To begin with, it is not a complex at all, there is a ticket counter and few jet-ski scooters and banana boats and nothing more. I wouldn’t suggest this to anyone. 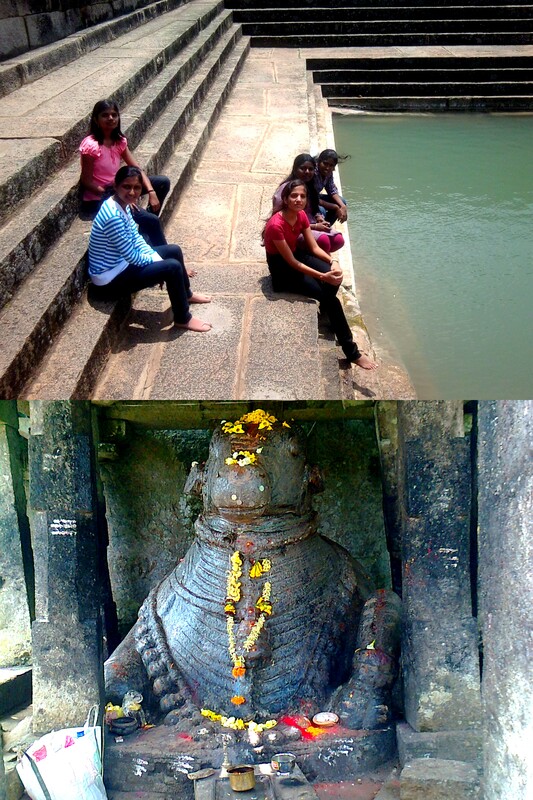 We just went around the dam and left for Shravanabelagola. Shravanabelagola can be reached from Channarayapatna and it was about 15 kms from the main highway. 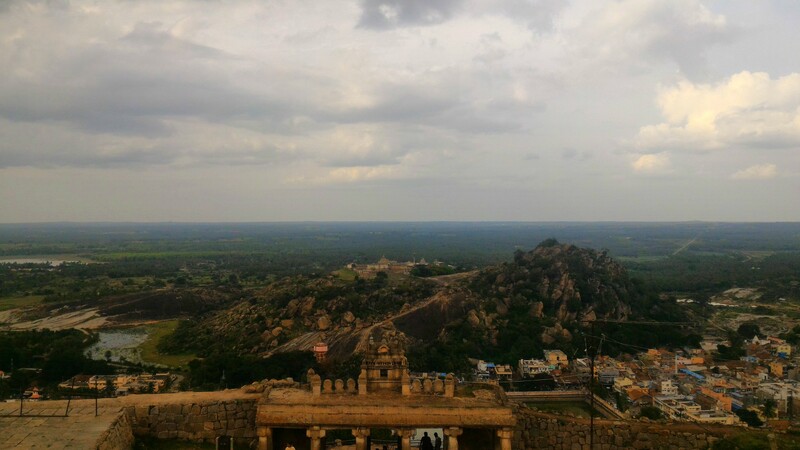 Shravanabelagola is nestled in between two holy hills Chandragiri and Vindhyagiri and the Gomateswara temple is located on the top of the hill Vindhyagiri. 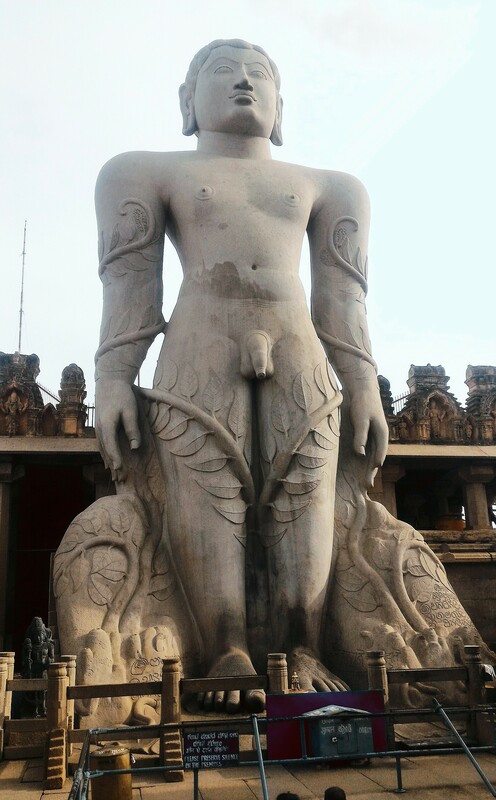 Shravanabelagola, a home to 2300 years of Jain heritage is surrounded with the lush green coconut grooves and serene natural water bodies which bear the testimony to the legendary mental strength of Tyaga (renunciation) and the tender message of Ahimsa (non-violence) that embody the Jain way of life. 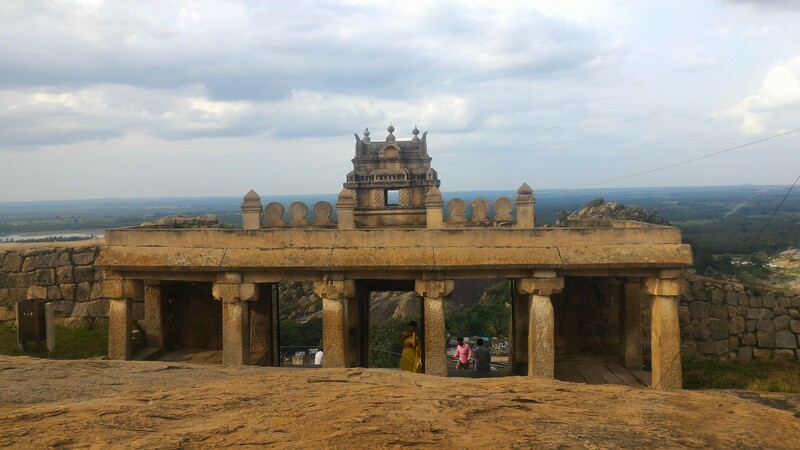 We reached Shravanabelagola at around 4.30 pm and realized that we got a tough task ahead of us. The Jain Shrine is on top of a hill and one has to climb about 6oo steps to reach the temple. We deposited our footwear at the counter near the foot of the hill and started climbing on. One important thing here is that there are also human-carried-chairs in which the old people and people who can’t climb the steps can be carried to the top by paying some amount to the porters. We came across few such 🙂 It took us around 30 mins to reach the hill-top and there is a temple just after reaching the top, we reserved it towards the end and started walking towards the main temple. It took us another 15 mins to reach the main shrine. Finally, there stood the 17.5 m (57 feet) high monolithic statue of the Jain Deity Gomatheshwara (Bahubali) just infront of us when we entered the main temple. This statue is also considered to be the world’s largest monolithic statue. History tells us that the statue of Gomateshwara or Lord Bahubali was built by Chavundaraya, a general in the service of Ganga king Rachamalla. 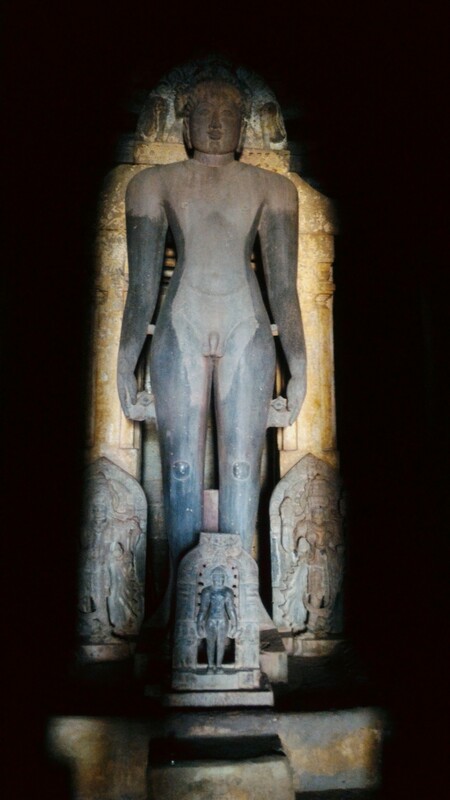 Carved by the great sculptor Aristenemi from the huge rock at the peak of Vindyagiri hill in Shravanabelagola, the statue was completed around 981 AD. The temple was quite small with the main statues standing in the middle and small space in front of it for the pilgrims to sit and perform puja or bhajans and there are few more small temples around it which hosts all the 24 thirthankaras of the Jain religion. We had a round around the temple and went near to the feet of the statue where stood a Pundit giving the prasad and blessings.Another small statue is placed in between the feet of the monolith and lots of pujas were being done to it. Some of our friends told us that the sunrise at Mullayangiri would be too good and we decided not to miss it. But our driver is so reluctant to drive us there so early in the morning. As we didn’t understand why he was so reluctant, I called up Mr. Mahesh to convince the driver. But at the very mention of sunrise, he was like as far as he knows there won’t happen any sunrise in Mullayangiri at that point of time and that he won’t recommend a drive to the hill during the dawn. So, we have dropped our plan of starting at 5.30 and we decided to start at 6.00 AM instead. We woke up at 5.30 and were downstairs by 6.00 AM just to see our driver still sleeping in the car. It was only by 6.30 we started our journey to Mullayangiri which is located at a distance of 16 km from Chikmaglore. The drive is an amazing experience as the expanse of greenery on the road sides seems endless, the lofty hills surrounding the way and the coffee blossoms filling our noses. 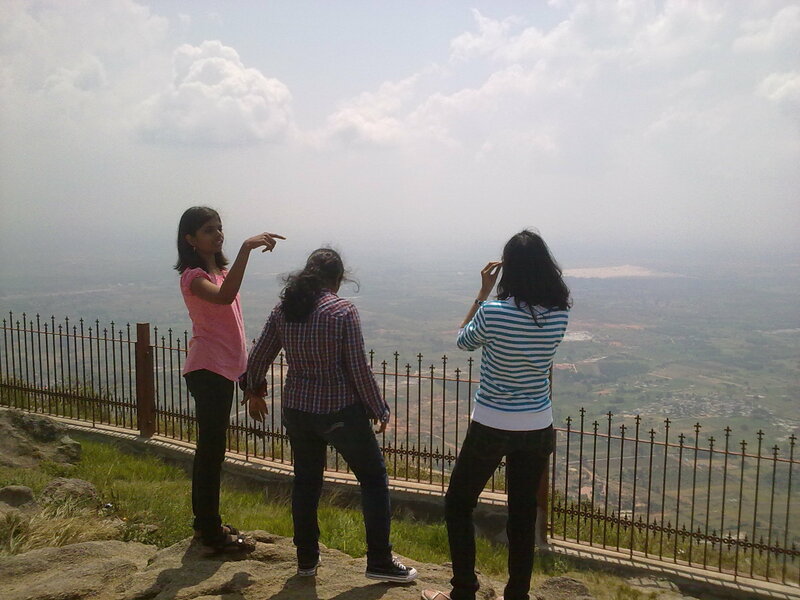 We decided to trek for a short distance rather than reaching the hill-top in our car. We stopped at Seethalayyanagiri which is 4 kms down from Mullayangiri to start our trek. 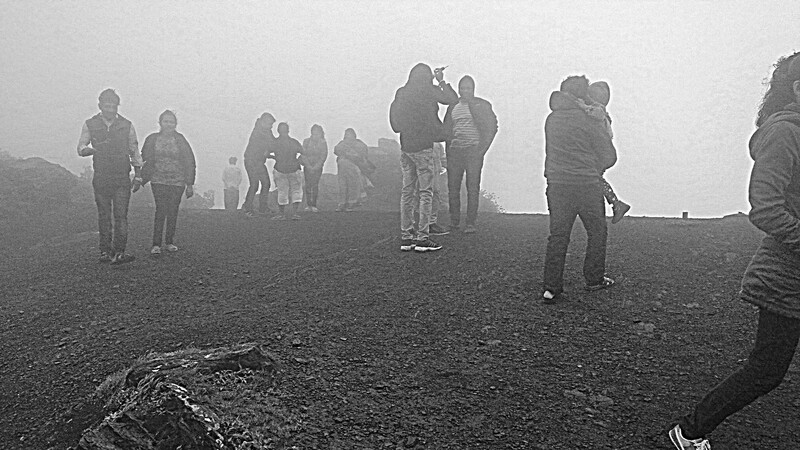 It was too foggy and cold and alas we forgot our jackets 😀 . After a few steps we saw a stair case leading to the Mallikarjuna Math. The math is most frequented by the members of the Lingayat community. Also found here is a temple dedicated to Seethala and Mallikarjuna and it is believed that the water level here neither decreases nor increases. 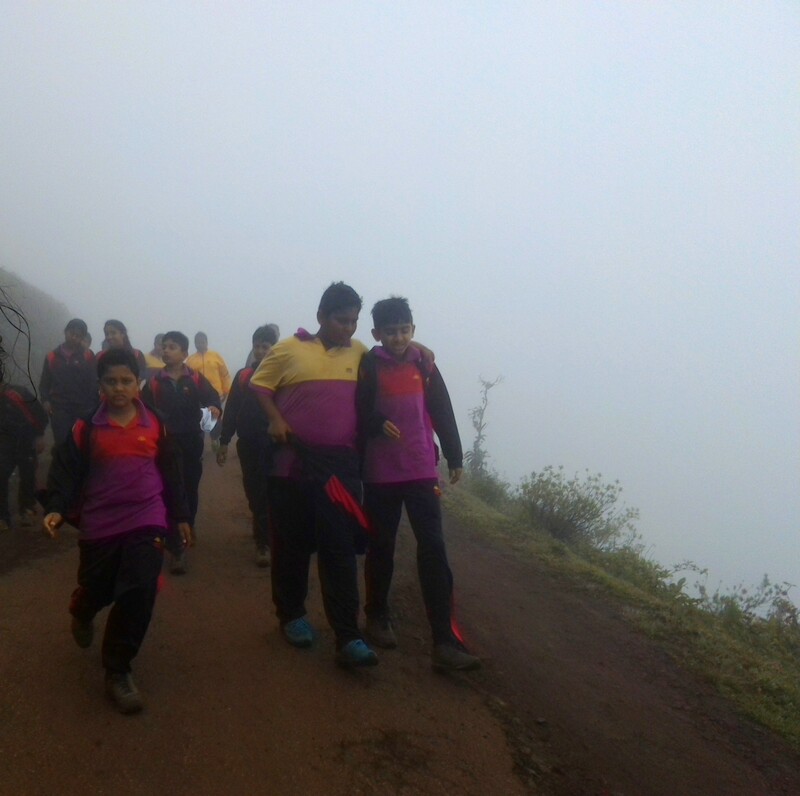 We started ascending the hill and the environment around us was quite lively as the Amber Valley School children were also on their cross-country trip on the same day. While a few children were running to reach first, few others were walking as if they are totally out of the competition and were there to relish the moments. We also started running along with them and stopped when we found a trail through the woods beside our road. Though we were not sure whether the trail leads us to the hill-top, we thought of giving a try. 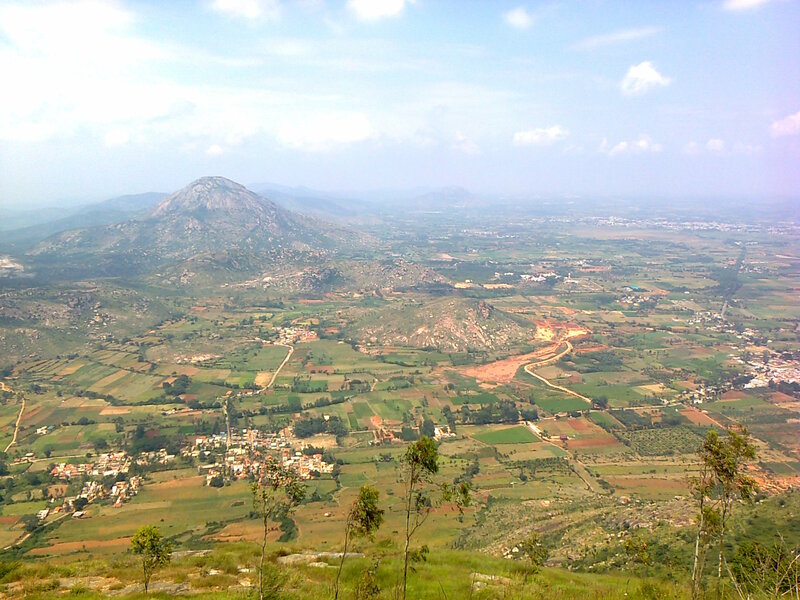 After clicking few snaps here, we started descending the hill and it took us very less time to reach Seethalayangiri. We decided to go to another place called Kavikalagandi which is some 6 kms away from Seethalayangiri. 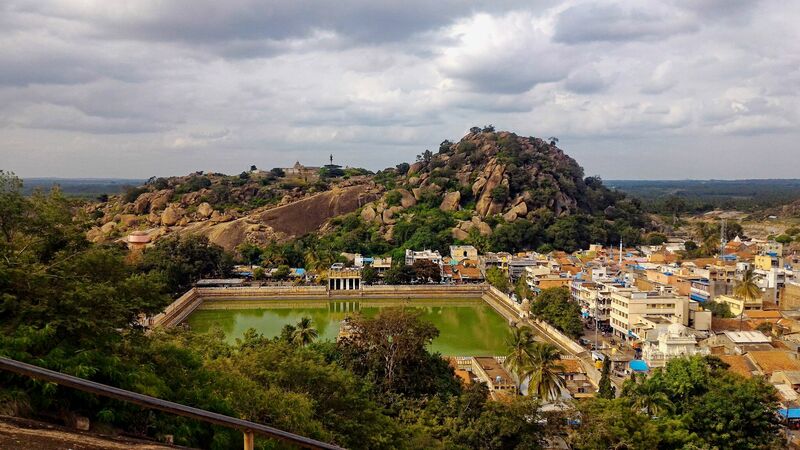 We have to ascend few steps in order to see what Kavikalagandi has to offer us. The panoramic view from the top of this view-point is breathtaking. 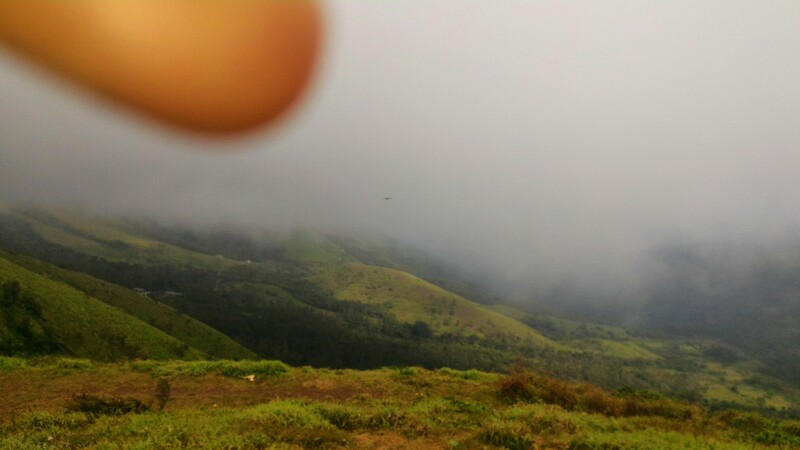 After relishing the calmness of the place, we returned back to our car and headed to Chikmaglur. On our way back, we stopped at the restaurant “Siri Coffee” and I would definitely recommend this to everyone as one can get fresh breakfast and a tasty brew of coffee. The restaurant is quite happening place and well-maintained. Quick breakfast and we headed to the M.G.Park in chikmaglur, which is not a big one but hosts a toy train :-D. And we didn’t miss it. I won’t say that it’s a must place, but if you have time, you can definitely try..
After a good meal, we resumed our journey and reached Belur which was built by King Vishnuvardhana commemorating his victory over the Cholas at Talakad in 1117 AD. Located on the banks of the river Yagachi, Belur, earlier referred to as Velapuri was the early capital of the Hoyasala Empire. 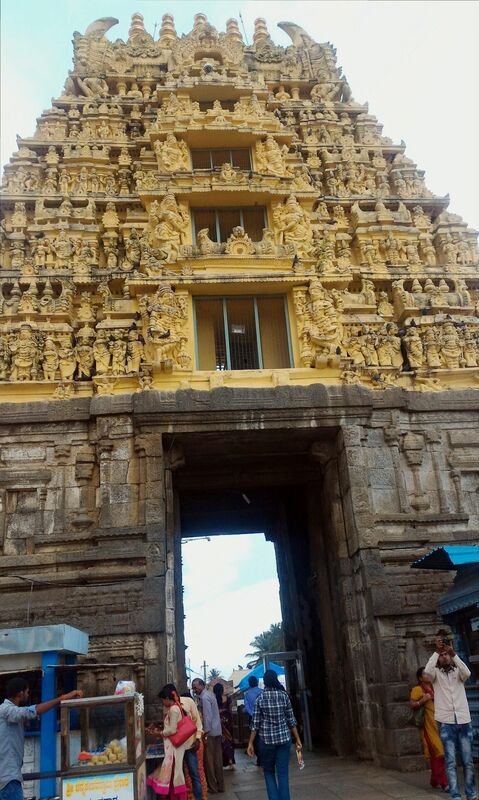 We walked towards the Raja Gopura (main entrance) and entered the temple complex. The Chennakesava temple or the main temple is situated in middle of the complex facing the east. 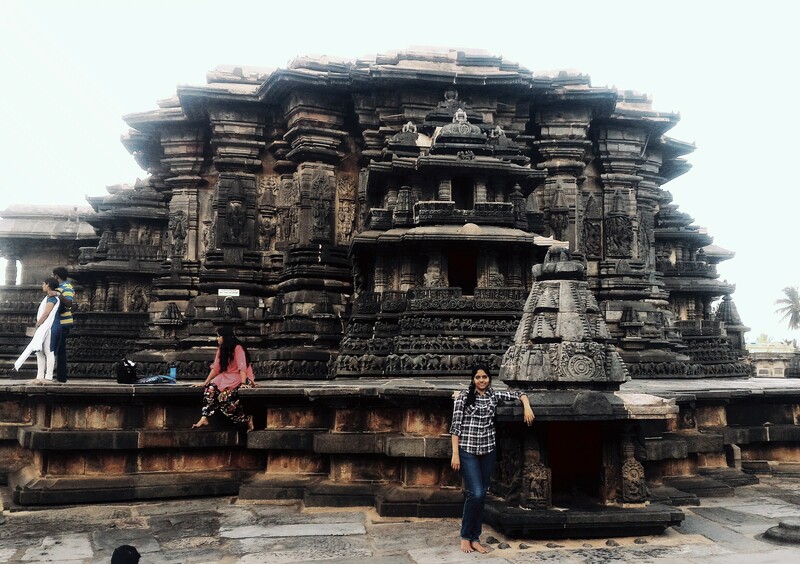 The temple almost resembles the Hoyasala temple in Halebidu, though it is not overly decorated like the latter. 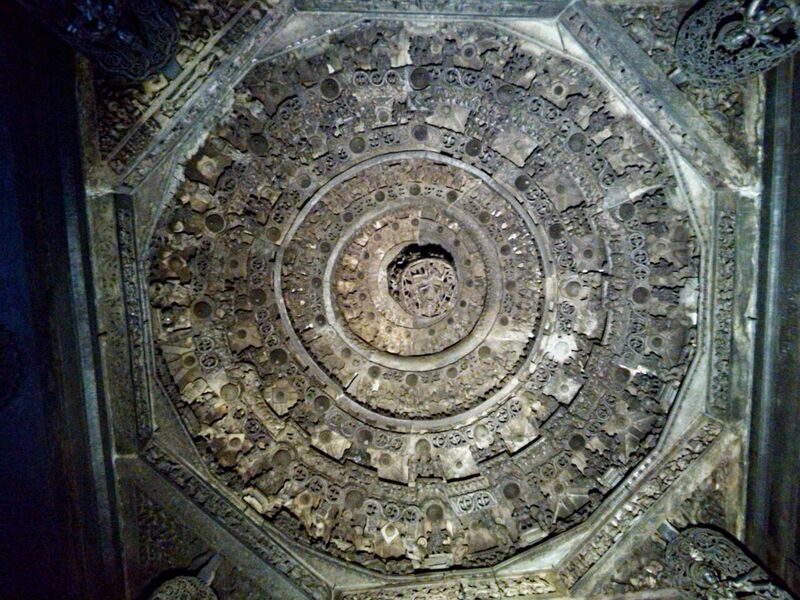 This 500 year old temple which took 103 years for completing its construction is made of soapstone and is made of interlocking components giving it a structural integrity. This temple has three entrances with doorkeepers carved on both sides and is pretty dark inside. 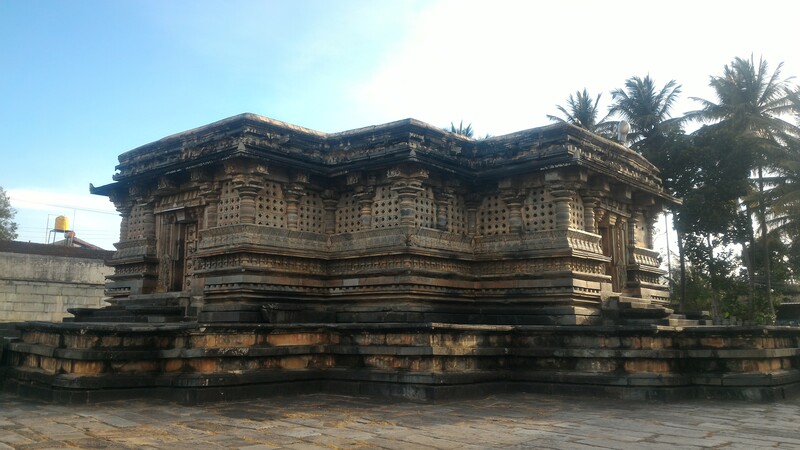 While the Hoyasala temple at Halebidu doesn’t have much of inner architecture, the Chennakesava (a form of Krishna) temple at Belur is famous for its inner architecture. It is said that the temples were built by the famous sculptor Amarashilpi Jakkanna. There are multiple intricately sculpted pillars supporting the roof and each of the statues on those pillars is different from each other. While one is said to Mohini, the other statue is that of a lady holding a parrot while the other pillar is called the Narasimha pillar. 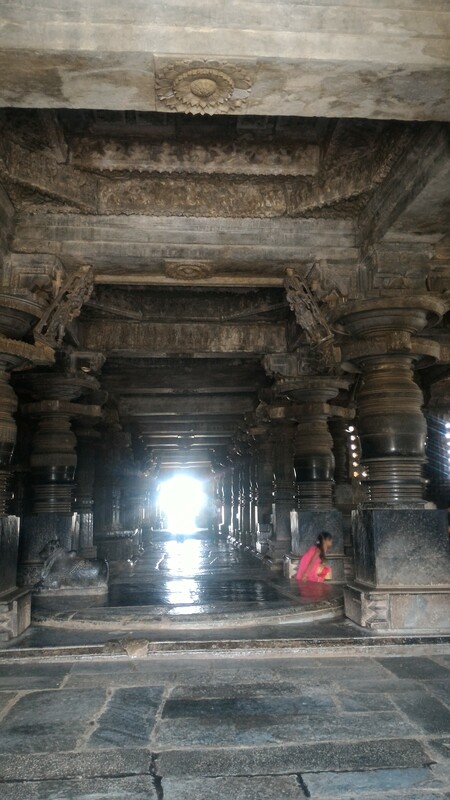 But what attracted me the most is the finely carved ceiling in the main temple hall infront of the sanctum where the Lord Chennakesava is seated. 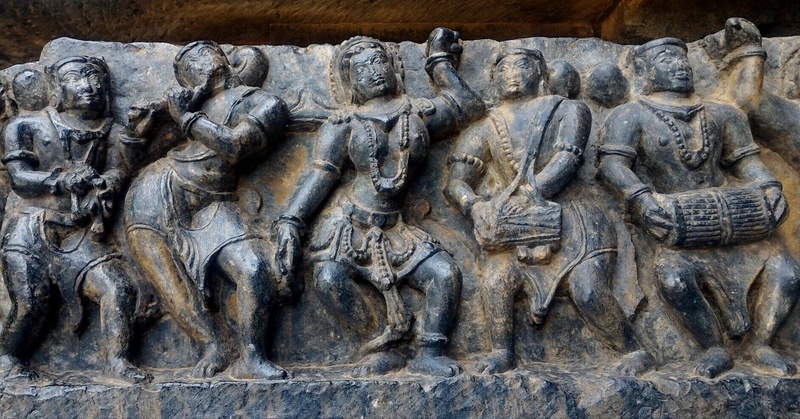 The Belur temple is famous for its large size splendid carvings of various Gods and Goddesses on its outer walls. A temple dedicated to Saumyanayaki, which has a Garbhagriha, surmounted by a tower is located to the south-west of the main temple and the Veera Narayana temple raised on an elevated basement is to the west and this temple has beautiful sculptures on its outer walls. The temple which is now on the UNESCO World Heritage List has a Kalyani (Tank) in the north east corner of the complex. This tank is also known as Vasudeva Sarovara and the periodical temple rituals are carried out in this tank. The temple complex also has a well, whose water is used for various activities in the temple and a gravity pillar showing the scientific skills of our earlier days. The annual Ratha Yatra at the temple takes place between the months of March and April. As it was only we two into the trip, we thought of choosing a package instead of driving ourselves to this place. In our search over the Internet, we came across a 2-day, 1-night package and found it feasible enough. The package was offered by the Karnataka Vacations and we contacted Mr. Mahesh, Manager of KV. He is an amicable person and made few quick changes we have asked for and the payment was done. We set on our trip from Bangalore at 10.00 AM from Bellandur, Bangalore and the cab driver Vasanth Kumar, though a very reserved person found to be quite friendly. We had our breakfast on our way and managed to be on the outskirts of Bangalore by 11.30 AM. The drive from here was smooth as the roads are in very good condition and there wasn’t too much of traffic. 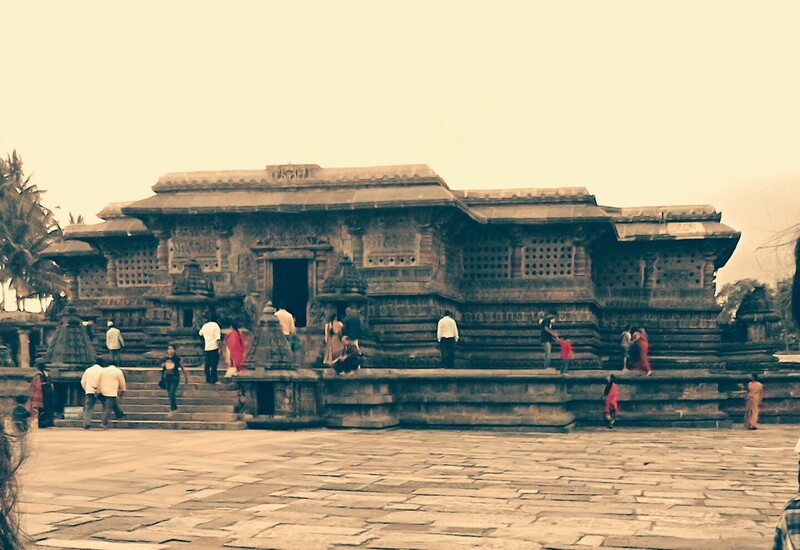 About a distance of 200 km from Bangalore, situated is the Hassan district and it took us around 3.5 hours to reach here and a further drive of around 30 kms left us at our first destination Halebidu. We got down our car and started walking towards the famous Hoyasaleswara temple, a Hindu temple dedicated to Lord Shiva. The temple which was previously known as Dorasamudra or Dwarasamudra, or the entrance to sea is believed to derive its name from the Hoyasala ruler King Vishnuvardhana Hoyaslaeswara. The temple has four entrances on east, west, and south and the visitors usually enter through the entrance on the north side. The temple is dark inside as there are no lights other than the light entering through the entrances. 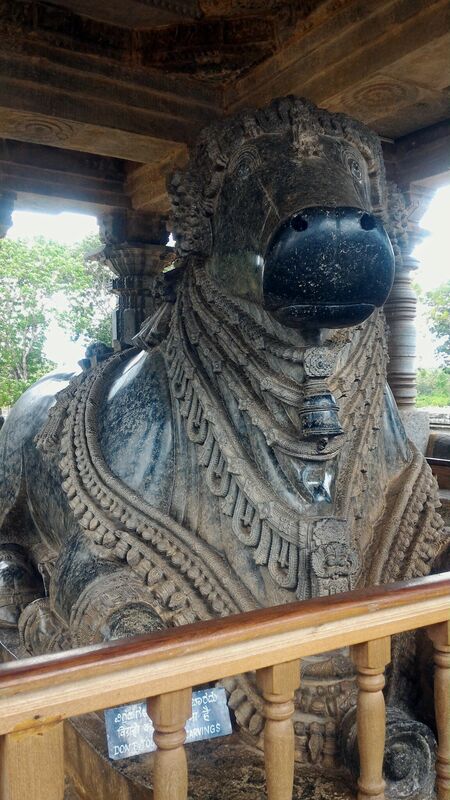 There are two large mantapas hosting two large Nandi (the Bull god) statues in each one of them located such opposite to two of the temple entrances. And one of these is known to be the most beautifully decorated Nandi statue in India and is also amongst the largest statues among the world. The temple complex also has an archaeological museum which preserves the important excavations in and around the area. 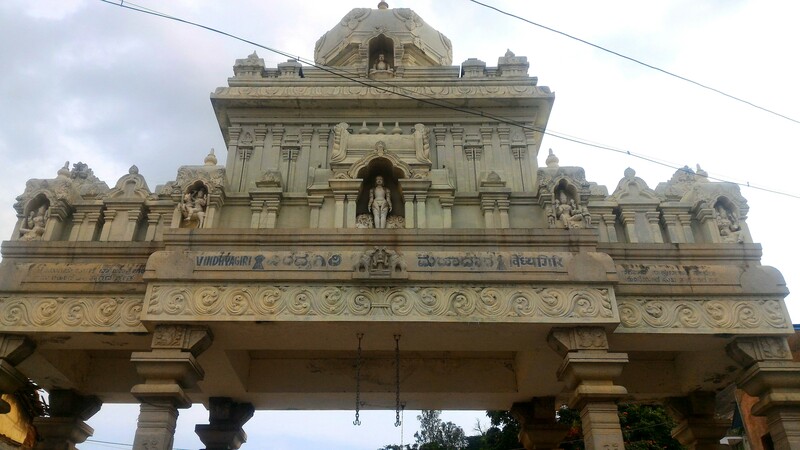 We finished our tour around the temple and headed towards Jain Basadi, which is located at a distance of 2km from the Hoyasala temple, and has three Jain temples dedicated to Parsavanatha (west), Adinatha (central), and Shantinatha (east) thirthankaras. We entered the temple complex through the gate at the West and walked towards the temple which is just infront of the entrance. This is built of soapstone and had a garbagriha. The most important attraction of this temple is the 18 ft tall Parsavanatha Tirtankara statue in the Garbhagriha (sanctum). The temples were so dark without any lamps and we should be very careful while walking inside the sanctums as we will be hardly able to see anything. The temple complex is not very rich in architecture on the outer walls of the temple. Though we can see some fine architecture inside the sanctums, we can hardly see any carvings on the outer walls of the temple except for some inscriptions. But the striking thing in this temple complex is that, while in one of the temples the pillars are highly ornate and coarse, the pillars in the other are highly polished and has a glossy look and touch. 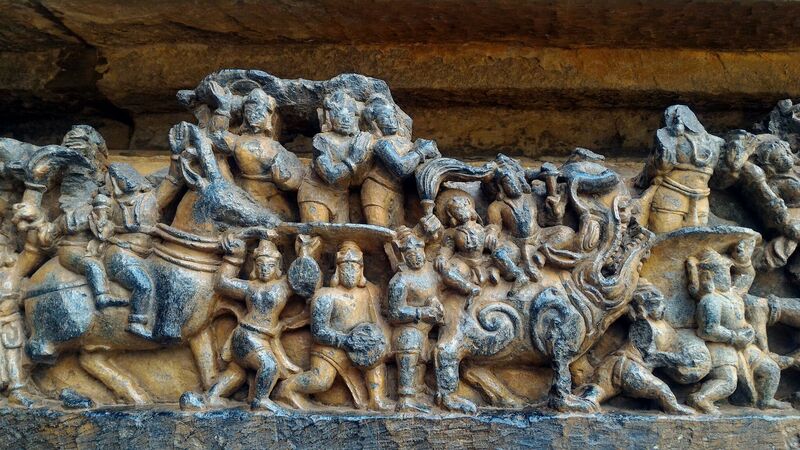 In all, Halebidu is a place which shows how secular the kings were in the good olden days. Nandi Hills or Nandidurg or Nandi Betta is an ancient hill fortress situated at a distance of about 65 kms from Bangalore, Karnataka. These lie at an average elevation of about 4850 ft above the sea level. 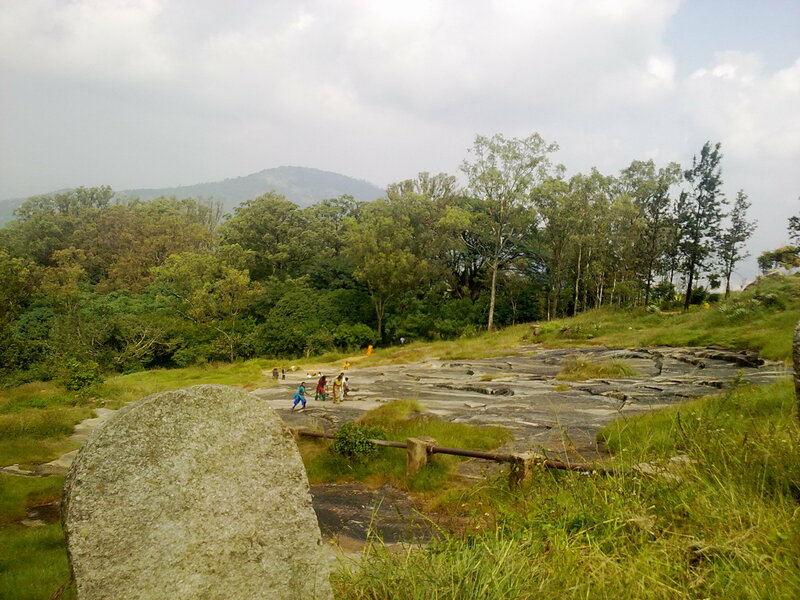 A popular weekend destination and it can be easily reached as it is well connected by roads with Bangalore as well as Chikkaballapur. 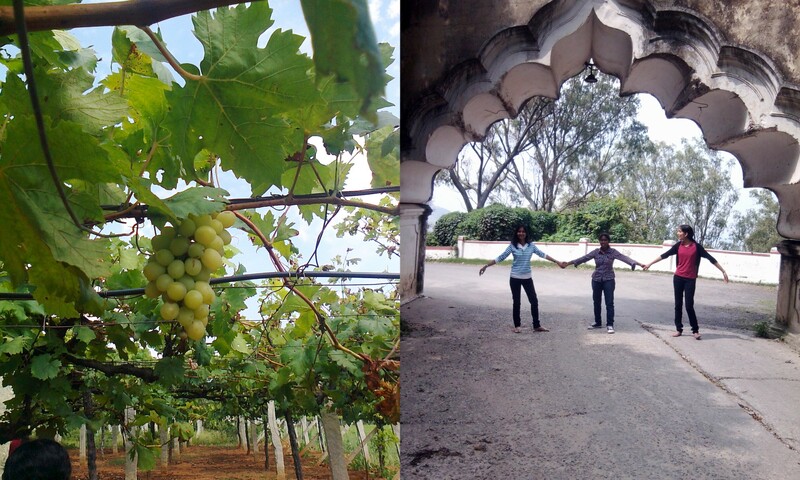 The route from Bangalore to Nandi hills is so scenic and interesting, as it gives us a chance of seeing some good temples, old forts, grape vineyards and mustard fields. And the curvy roads leading to the top of hills are best to trek or cycle. 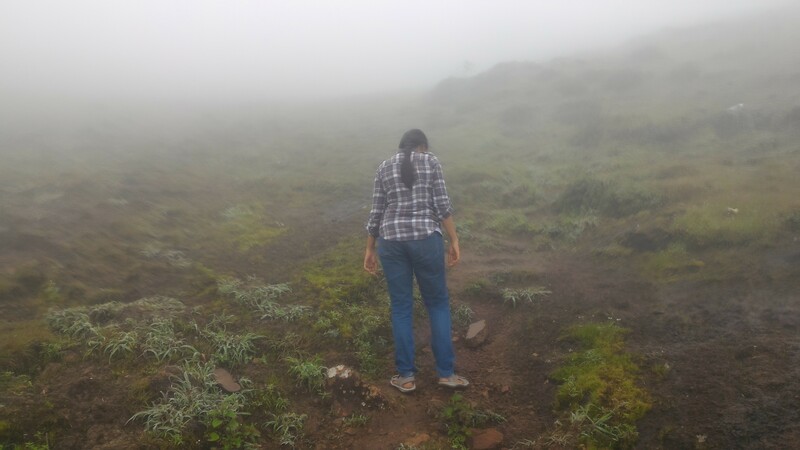 One can go for a road trek or a wild trek on the backside of the hill. Plenty of opportunities 🙂 If you own a bicycle, well fine and good otherwise there are lots of bicycling clubs which organizes weekend cycling trips. Can try one! The main attraction is the statue of the Nandi Bull which is located on top of the hill. 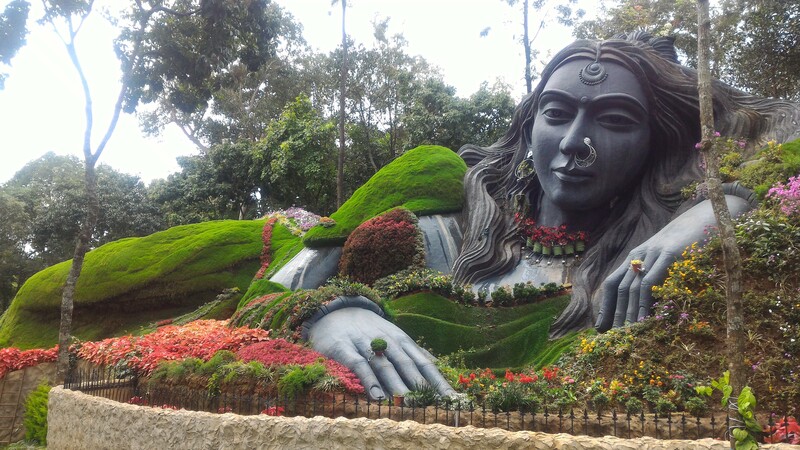 And the belief is that the hills resemble a sleeping Nandi Bull, and hence the name Nandi Hills. 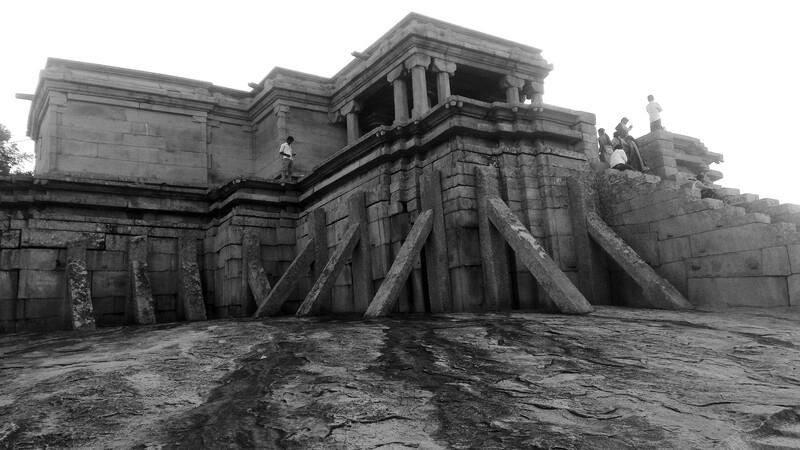 There is also an ancient temple of Yoga Nandeeswara atop the hill. 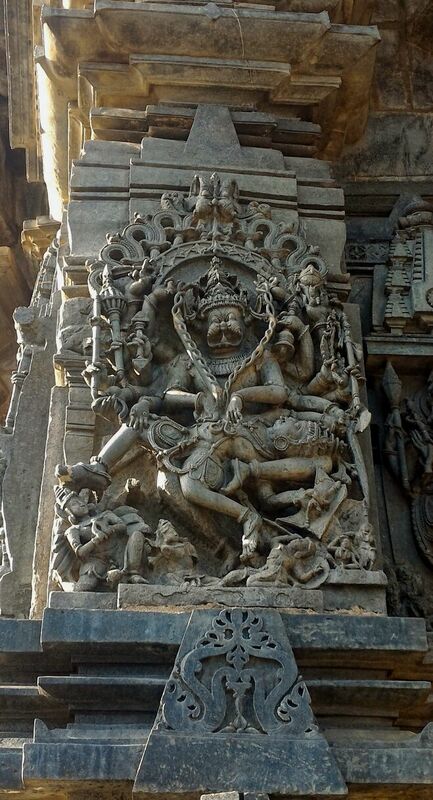 There are also temples dedicated to Sri Ugra Narasimha and Yoga Narasimha. The hill is the Sultan Tipu’s Summer Residence and there is a palace which is not open for public 😦 . Interesting place is the Tipu’s Drop, a 600 metre high cliff face, where prisoners and convicts during Tipu’s reign used to be pushed off this cliff. There is also a children’s park, for a while we too can be children swinging on the cradles. Lol! 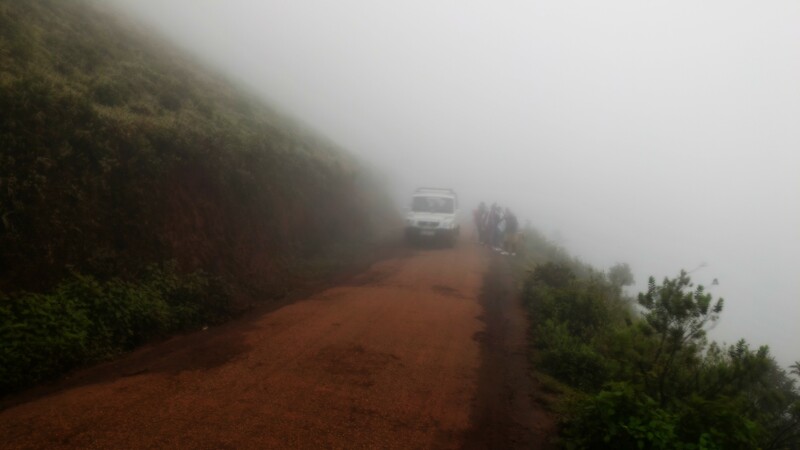 Nandi hills is a haven for nature lovers with magnificent views and enticing scenic spots, if we are lucky enough we can spot some wildlife too. One should not miss the sunrise here. 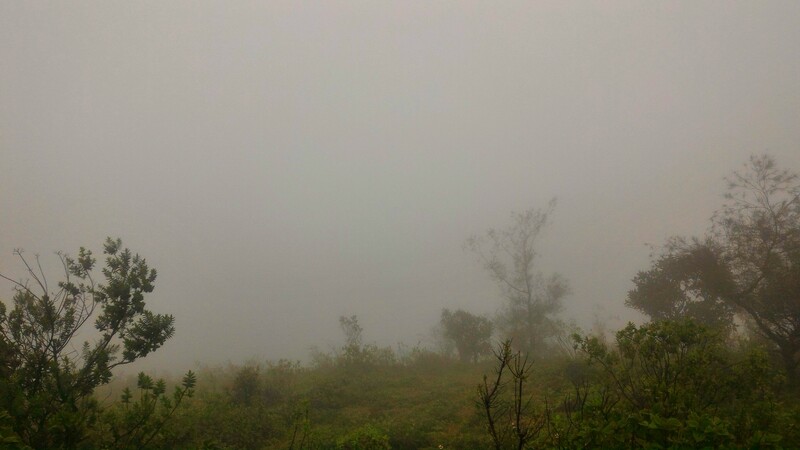 The wind, fog and the clouds that blow towards us when we are in the midst of the tall trees on top of the hill before the sunrise is just amazing and a life-time experience. One won’t regret waking up at 4 in the morning after enjoying the sunrise here!